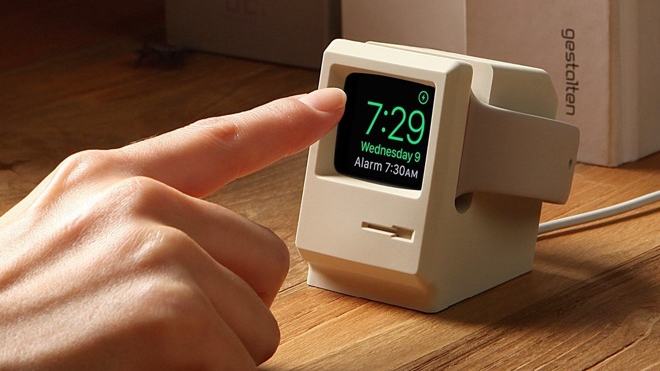 You may think you don't really need a stand for your Apple Watch, but that's probably before you stumble across this wildly nerdy and nostalgic desk accessory. We're talking, of course, about the Elago W3 Apple Watch stand. Not only can you show off your unyielding Apple fandom, but the silicone stand also helps your device look like a miniature Macintosh, coming complete with a floppy drive cutout. The W3 can hold both the 38mm and 42mm models of the Apple Watch Series 2 and Series 1, as well as allowing you to make use of Nightstand mode so you can keep sharp tabs of the minutes dwindling away. As you might expect, the design isn't too complicated. The charging pod slides into the circular hole at the back of the stand, with the cable tucking under. Those looking for an authentic Macintosh vibe— you know, minus the software, keyboard and mouse — can also remove the Apple Watch straps and allow the device itself to sit within the stand. Considering most Apple Watch stands can be on the pricey side, including Apple's own magnetic charging dock, picking up this in white or black for just $15 actually seems pretty reasonable. And if retro Apple callbacks aren't what you're looking for in a stand, you can always customise your own with the SwitchEasy BLOCKS or let your iPhone join the party with the Belkin Valet Charge Dock. Failing that, just keep letting your smartwatch and charge cable slide off your bedside table every night. Thought not.